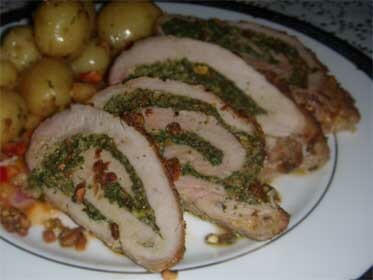 Pesto Stuffed, Pork Tenderloin Recipe by Cap'n Ron. 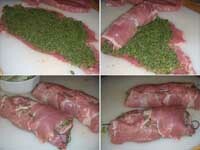 This recipe for a Pesto Stuffed, Pistachio Coated Pork Tenderloin will really knock your sox off. The flavors go so well together, especially when served on a bed of a Fruit Salsa. For the moment, I'm cooking in a house with a real kitchen, not a tiny galley. I also don't have a grill, so I'm going to have to "punt" for a while. I bought a deal on Pork Tenderloins the other day, and made a Cherry Stuffed Pork Tenderloin, with a Cherry Sauce, and was trying to figure out what to do with the other 2. I finally realized that I've not posted a pesto yet, plus, I've been dying to cook something with Pistachios. This one fits the bill perfectly. The Pesto was great, and I was able to use up a bunch of fresh lemon / basil that was growing on the porch, along with using pistachios instead of the more common pine nuts. The combination was perfect inside the Pork Tenderloin. The Pork Tenderloin ended up moist, and tender, and the Pistachio Pesto went real well with the Caribbean Fruit Salsa. 1. Put the first 6 items into a food processor. Process until everything's broken up. 2. While the processor is running, drizzle in the olive oil until a smooth paste is formed. 3. Remove any Silver Skin, then butterfly the meat by using a sharp knife to cut almost through. Place a plastic baggie over the meat, and pound it to about 1/4" thickness. As is shown in this picture from my Cherry Stuffed, Pork Tenderloin. The Picture is from my recipe for a Cherry Stuffed Pork Tenderloin. 4. Remove any Silver Skin, then butterfly the meat by using a sharp knife to cut almost through. Place a plastic baggie over the meat, and pound it to about 1/4" thickness. Place 1/2 of the Pistachio Pesto along one long edge, and roll it tightly. Because I wanted to coat this meat with chopped Pistachios, I used 8: Kebab Skewers to fasten the end, after the meat's been rolled. 5. Mix the Honey Mustard, using enough honey to just barely cut the sharp mustard taste. All Mustards and Honey are different. That's why I can't give you an exact amount of honey to use. I used a good Horseradish Mustard, because that was what was in the frig., along with Barley Honey. Just be sure to mix it up to your taste. 6. 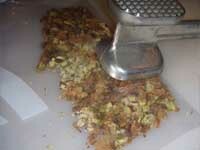 Place the pistachios in a freezer bag, and crush with a meat mallet. Don't turn them into a powder, just get them broken up. 7. 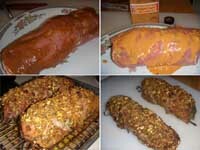 Coat the top of the Pork Tenderloin with Honey Mustard, or, you can use some leftover Cheddar Wing Sauce Mix, and coat with the crushed pecans. Set the Pork Tenderloin Rolls on a rack in a parchment lined sheet pan, to cook. 8. Cook at 350 degrees for about 45 minutes, or 145 degree internal temperature. Let them rest for 10 minutes before cutting 1/2" thick, on an angle. 9. I served this on a bed of my Caribbean Fruit Salsa, along with some Garlic and Butter New Potatoes. 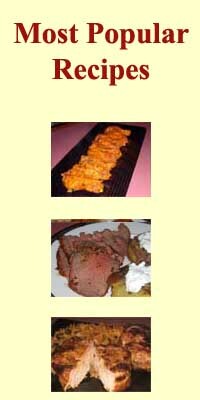 This recipe prints as a shortened version, with only 1 Picture, Ingredients, and Directions. Be sure to check out my offer of Free Shipping. Leftovers can easily be he-heated in the oven. Slice them on a diagonal, 1/2" thick, then lay them out in a small pan. Place them in a cold oven, turn the oven to 350 degrees, and cook for 10 minutes. Remember, you're just re-heating the meat, not cooking it, so just heat until it's warm.